There are those who say America is losing its regional identity, that there’s no more difference between Spokane and Spotsylvania, Klamath Falls and King of Prussia than there is between fast-food stops along the interstate. They say the mass media has homogenized our culture, making us all look the same, dress the same, act the same, and talk the same. Then there are those who disagree with this proposition. Associate Professor of Linguistics Bert Vaux is one of them. Vaux is in a position to know. He has been conducting an online survey of regional speech differences that will eventually form the basis of an Atlas of English Dialects. The survey has received about 15,000 responses so far, enough to pepper a map of the United States with concentrations of tiny colored dots showing distinct regional differences in pronunciation, idioms, and grammar. Among the survey results are intriguing variations in the names people in different areas use for common objects. For example, in Boston and Milwaukee, the thing you drink from at the playground is called a bubbler. In the rest of the country, it’s a water fountain or a drinking fountain. Why? The reason may be Boston-to-Milwaukee immigration, or it may be that “bubbler” is an older term that has died out in the rest of the country leaving two isolated linguistic islands. New York City is another place where unique speech patterns frequently occur. Some, like stoop (the steps leading up to the front door) are holdovers from when New York was the Dutch colony of New Amsterdam. Others like “I stood on line” rather than the far more common “I stood in line” are of mysterious origin. Even people who have worked hard to rid themselves of a regional accent can reveal their origins by calling a common object by a distinctive name. Perhaps the most alias-intensive item in Vaux’s survey is the sandwich consisting of cold cuts stuffed into a split hunk of French bread. Most of the nation, including Boston, calls it a sub, but in parts of Connecticut, New York, and New Jersey it’s a grinder, in New York City it’s a hero, in Louisiana and parts of the South it’s a poor boy, in Maine it’s an Italian sandwich, and a few isolated speech pockets call it things like bomber and sarney. Other regional variations are grammatical, although these tend to be less common. One that is still prevalent in the South is the use of more than one modal verb, as in “I might should do that.” Bill Clinton, occasionally slipping back into his Arkansas dialect, has been known to use this form. Despite the mass media’s preference for “standard” accents, regional variations in pronunciation are still extremely common. For example, do you pronounce “cot” and “caught” differently? Most people in New England and the Midwest pronounce both words as if they were speaking of the fold-up bed. For New Yorkers and others, there’s a difference. Vaux’s Atlas of English Dialects should go a long way toward updating currently available dialect studies, which he says are hopelessly out of date. Many of these were compiled as long ago as the 1930s, mainly in rural areas. The words used to distinguish between dialect regions are often obscure, archaic terms which have disappeared from use. 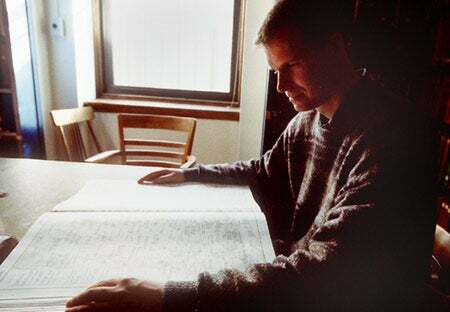 Vaux began his survey as a photocopied handout in his course, “Dialects of English.” With the help of linguistics concentrator Scott Golder ’03, he later transformed it into a Web-based study, making it possible to survey a far greater number of people. For Vaux, the survey of English dialects is an extension of his first love, the study of dialects of Armenian and other little-known languages of the Caucasus and Central Asia. He is especially interested in preserving languages and dialects that are on the verge of dying out, working with tiny groups of elderly speakers of languages like Kalmyc, Udmort, and Abkhaz. “I’ve always been interested in nonstandard groups and cultures,” he said. Besides offering an inherently fascinating snapshot of how Americans speak, Vaux’s Atlas of English Dialects will also persuade speech snobs that no dialect is really any better than any other. At least that is what Vaux hopes.